The road to hell is paved with good intentions, an economics professor of mine used to say back in the late 1980s. Concerned about the federal government’s inability to reign in fiscal deficits, hell back then was hitting a “financial wall” where the markets would no longer lend or would only do so at catastrophically high interest rates. In hindsight, those fears were grossly overstated, but you have to admire the seriousness with which public policy was concerned about future generations. Hell circa 2018 is less metaphorical and more literal: the ongoing and largely irreversible heating of the planet towards something much less habitable by humans and other creatures. This summer’s extreme heat events around the globe were headline news. In BC more than 2,000 forest fires in 2018 have burned 1.3 million hectares. This surpasses last year’s record, which cost the Treasury more than half a billion dollars to fight. Smoke from the fires prompted health concerns in BC cities and as far away as Edmonton and Calgary. Concern for future generations this time around, however, is rather meh. With its long timeframes, global scope and technical jargon, climate change is a challenging issue. Politicians are afraid of rocking the boat by confronting our carbon-intensive lifestyles so glacially paced change is the order of the day. Politically, we shift from outright intransigence on the climate file (e.g., former Prime Minister Stephen Harper and former Saskatchewan Premier Brad Wall) to faking that we care by patting ourselves on the back for “climate leadership” while doing next to nothing to change (e.g., Prime Minister Justin Trudeau and former BC Premier Christy Clark). With its long timeframes, global scope and technical jargon, climate change is a challenging issue. We are coming up on three years since the Paris Agreement of December 2015. From the previous BC government’s Climate Leadership Team to the federal-provincial Pan-Canadian Framework on Clean Growth and Climate Change to the platforms tabled in the last BC election, our leaders have had ample time to come up with a substantive plan. In its first year in power, the new BC government has increased the provincial carbon tax and improved the carbon credit, created a new Climate Solutions and Clean Growth Advisory Council, and legislated a new medium-term target of a 40% reduction in greenhouse gas (GHG) emissions by 2030. The government also released three “intentions papers”—on buildings, transportation and industrial emissions—for public comment in the lead up to a new provincial climate plan this fall. Several more intentions papers are promised in 2019. I review the intentions papers below, starting with direct household emissions from transportation and buildings, then moving to the trickier topic of business/industrial emissions and how these relate to employment in BC. Much of the public conversation on climate action is framed around reducing GHG emissions from households. Direct emissions from households (such as private vehicles and home heating), however, only represent 30% of BC’s total emissions. The other 70% of BC’s total emissions are from the world of work—from agriculture, resources, manufacturing, commercial businesses and the public sector. Spoiler alert: the intentions papers are underwhelming. What’s in the Intentions Papers? The three intentions papers (transportation, buildings and industry) do not state any sectoral emission reduction targets, although the government has promised to establish such targets. While accountability has been promised, there is nothing to point to along the lines of a carbon budget framework—as I have previously proposed—to ensure it. And the whole exercise has been strangely wrapped in vague “clean growth” language (see this post for a critique). As for substance, the ideas presented in the intentions papers, if implemented, would represent progress especially in light of the previous government’s masquerade of posing as climate leaders while committing to do very little in practice and actively courting a liquefied natural gas (LNG) export industry. That said, we are talking about incremental progress: there’s not too much that is new or aggressive in these intentions papers. Indeed, I see a surprising lack of urgency to make change happen. Reducing GHG emissions from transportation has great potential as they comprise 40% of BC’s total emissions. Second, almost the entire stock turns over every 15 years or so as vehicles need to be replaced. So new rules would be welcome to state that at a future date no fossil-fuel-powered cars will be sold in BC, and that at a later date they will be banned from the roads entirely. Alas, the Clean Transportation intentions paper waits until 2040 before requiring that all new cars sold be zero emission vehicles. More could be done to push the marketplace through zero emission requirements, including a faster timeline for zero emission vehicle penetration overall as well as pushing harder for zero emission fleets (e.g., car shares, taxis and ride hailing, commercial fleets). In addition, too much emphasis is put on improving BC’s low-carbon fuel standard, which requires fuel suppliers to decrease the “carbon intensity” of their fuels in 2020 by 10% relative to 2010 levels. The government is proposing to raise the requirement to 15% by 2030 and potentially to 20%. While this represents some incremental improvement, a stronger push to zero emission vehicles would be preferable. What about public transit, which was essentially ignored in the transportation intentions paper? Yes, we are finally going to break ground on the Broadway subway in Vancouver and light rail in Surrey after a decade of wrangling. But we should have a steady stream of capital investments in place that keeps construction workers going through a series of major new transit investments over the next two to three decades. And we should ensure that all new capital investments support a shift to a zero-emission transportation system (for example, shifting away from diesel buses). Such considerations are important in rural areas, too, as the provincial government will need to step in with a plan to compensate for the loss of Greyhound bus services. Buildings are already a strength for BC, which has implemented a voluntary Step Code—so named because it groups energy efficiency targets into increasingly ambitious “steps” for new buildings, the top step of which will become mandatory after 2032. Again, more can be done to implement building codes more quickly and aggressively rather than waiting 14 years. The Step Code could be improved and better aligned with climate policy by including GHG performance metrics. Moreover, any serious conversation about buildings needs to have restrictions on fossil fuel energy use, i.e., natural gas heating. Integrating with innovative low-carbon district energy systems, such as the Neighbourhood Energy Utility in Vancouver, should also be on the table. Decarbonization of the Central Heat operations (which uses natural gas to produce steam for heating office buildings) in downtown Vancouver should also be a priority. What about a retrofit program for existing housing and buildings? Since the expiration of the LiveSmart BC program many years ago no such funding has been available. The Clean, Efficient Buildings intentions paper hints at a new round of funding but does not state dollars or provide the parameters for such a program. Based on our climate justice research, a multi-year retrofit program should start with the oldest and least-efficient housing as well as multi-unit buildings, including rental apartments. In contrast, previous programs have tended to go mostly to the already affluent and are plagued by “free rider” problems (meaning those subsidized would have done the work anyway). We estimated that a $2.2 billion program over ten years would spur significant GHG reductions and fight energy poverty (when the quality of life in a household is compromised by the cost of energy) while supporting about 12,000 direct jobs per year. Another missing piece is to link buildings and transportation: the need for better land use planning to develop more complete communities where the most common destinations are much closer together, and the need for extreme commutes by car is vastly reduced. Government decisions about where to locate public services can help anchor these communities and with an aging population we will need complementary investments in health care, residential care and so forth so that seniors can live closer to the services they need. Achieving BC’s legislated targets means addressing carbon-intensive industrial activity, in particular, the emissions from the oil and gas industry and potential emissions from proposed LNG development. This area is additionally challenging in that carbon extracted and exported from BC soil, but combusted elsewhere, gets counted in the other jurisdiction’s GHG inventory. Exported emissions might not be a problem if the commitments made by countries in the Paris Agreement were enough to keep global warming below 1.5 to 2 degrees above pre-industrial levels. Unfortunately, this is not the case. One of the intentions papers, A Clean Growth Program for Industry, proposes that a portion of new and incremental carbon tax revenues be used as incentives for large industry, either through rebates to the best performers or to fund emission reduction projects. While this is an intriguing use of carbon tax revenues, the whole point of a carbon tax is to change incentives to affect decision-making. It would be better to simply commit to a schedule of raising the carbon tax annually. Missing from the industry intentions paper is any sense of the emissions profiles of different industries, in particular the fossil fuel industries. To fill in the gap, I updated an analysis of emissions and employment published by the Climate Justice Project in 2010. 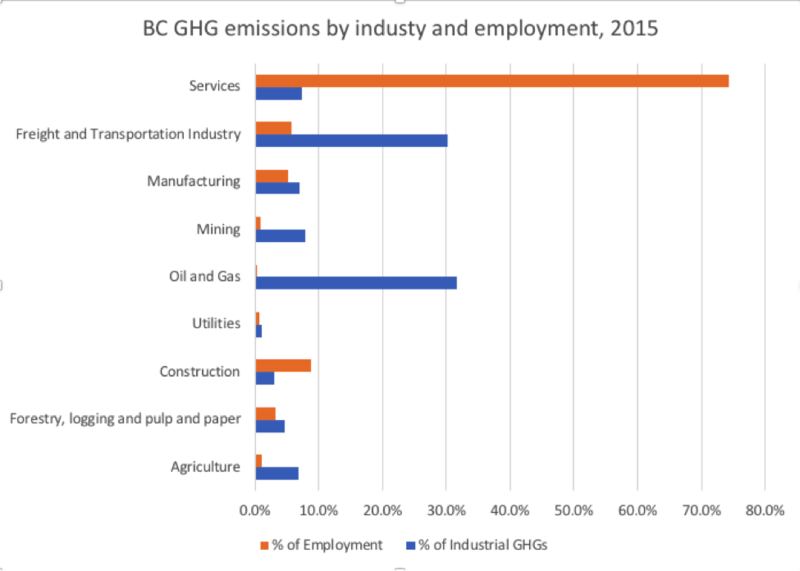 The Figure below shows BC’s industrial mix in terms of both GHG emissions and employment. The results include all industrial and commercial emissions in BC (70% of total emissions); household emissions from personal transportation and home energy use are not included. Data limitations mean that the analysis is for broad industry categories only. Source: Author’s calculations based on BC GHG inventory report and NAICS employment data. The vast majority of work done by British Columbians is in the provision of services (not including transportation), comprising almost three-quarters of employment. This is as diverse a sector as it is large, ranging from professional work to many less glamorous and more precarious jobs. For the most part, those service industry jobs are low-carbon: only 7% of emissions come from this sector and are related to the heating and cooling of office buildings. Decarbonizing the sector is largely a matter of improving energy efficiency and switching fuels to renewable sources in buildings. Oil and gas: Almost one-third of industrial/commercial emissions are from the oil and gas sector yet the sector accounts for only 0.4% of BC employment. Launching an LNG export industry would lock BC in to a high-emissions trajectory for several decades to come (see this post). Yet, LNG Canada’s regulatory filings state that while several thousand jobs would be created in the two to three year construction phase, only 200–400 permanent jobs would be created at full build-out. Mining: Some 8% of industrial/commercial GHG emissions are from BC’s mining sector, which has only 0.8% of jobs. This includes metals, minerals and coal. The vast majority of BC coal production, however, is not thermal coal for electricity production, but rather metallurgic coal used in steel-making. Mining metals such as lithium and rare earth elements to support renewable technologies could be growth industries for BC. Freight and transportation: Freight and other transportation services represent another 30% of industrial/commercial GHG emissions and just under 6% of employment. Decarbonization is challenging in this area although innovations in technology and systems are in development. Agriculture: Just under 7% of emissions but only 1% of total employment is attributable to agriculture. BC is far from food-secure and we import a large share of food from California, meaning that BC needs to find ways to mainstream low-carbon approaches while expanding the amount of food we produce in the province. How industrial emissions reductions will be achieved is not addressed in the intentions paper, only that some carbon tax revenues will be put on the table as an incentive for companies to meet certain benchmarks. Indeed, resolving the contradictions between climate and industrial policies is central to breaking from ‘business as usual’. Meanwhile, business lobbyists argue that “emissions-intensive trade-exposed” (EITE) industries should be exempted from climate measures because they would adversely affect their “competitiveness” relative to other jurisdictions. All of this points to the need for sectoral strategies that advance decarbonization in different parts of the BC economy. Sectors should each have a hard emissions cap that is lowered over time, and sectoral councils involving business, labour and government would then be tasked with achieving emissions reductions. Additionally, the best defense is a good offense, which can be achieved with efforts to create new green jobs in areas that decarbonize the economy as well as more inherently green jobs in the service sector such as child care and seniors’ care workers. These jobs are much more likely to be done by women, whereas most industrial jobs tend to be done by men. The new BC government intentions papers include a handful of policy ideas that would push BC incrementally towards its 2030 GHG target of 40% below 2007 levels. But the sum total of what’s there leaves the reader wondering just how those targets can actually be met. While we await a full plan later this fall, the good intentions on offer this summer lack the urgency called for by climate science and fail to confront the entrenched power of the fossil fuel industry. Some critics will state that whatever BC does on climate matters barely at all on a global scale. That’s true, but BC is a rich place full of smart people and plentiful resources so if we can’t do it here then no one can. Leadership means actually bending the curve on emissions by pushing ourselves into new territory. Given the overall state of climate policy in Canada there is real potential for BC to re-assert leadership on the climate file, but to get there we need a coherent plan that rejects fossil fuels in favour of zero-carbon alternatives. This piece was published as part of the Corporate Mapping Project, a six-year research and public engagement initiative jointly led by the University of Victoria, the Canadian Centre for Policy Alternatives’ BC and Saskatchewan Offices, and the Alberta-based Parkland Institute. This research was supported by the Social Science and Humanities Research Council of Canada (SSHRC). Let’s get the converstation going about important issues in BC. Please share freely. Stay in the loop on issues that matter in BC. Policy Note would not be possible without the support from our readers. Help us keep you informed. How green are BC’s climate policies?